Dragon Dictation has been our favorite speech recognition app for a while, and today's 2.0 update only strengthens that opinion. Not only does it bring the requisite iOS4 compatibility, but you can now speak your tweets and Facebook status updates. 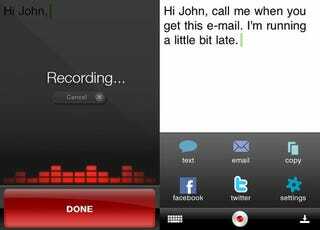 BURLINGTON, MA – July 23, 2010 – Nuance Communications, Inc. (NASDAQ: NUAN) today announced the availability of Dragon Dictation 2.0, currently free on the Apple App Store. Dragon Dictation 2.0 is iOS4-compatible, and delivers multilingual support and a new easy-to-use interface for speaking text messages, emails and social media status updates without ever having to leave the application itself. First introduced in December 2009, the popular Dragon Dictation App has been downloaded by millions and ranks as a number one business productivity application that enables iPhone, iPad and iPod Touch users to speak text content for everything from email messages to blog posts. Dragon Dictation 2.0 features a fun-yet-convenient pop-up toolbar with app icons that allow people to speak a status update and send it directly to Facebook or Twitter, or speak any text and send it directly to the text messaging client or clipboard – all without leaving the Dragon Dictation app client. Dragon Dictation 2.0 also features an Auto Save function that automatically saves your dictated text when interrupted by an incoming phone call. Nuance also announced today that Dragon Dictation supports both U.S. and U.K. English, with additional language support to be added soon, beginning with German later this month. All Dragon Dictation users are able to easily switch between supported languages as they become available. "Millions of people have downloaded Dragon Dictation for iPhone, iPad and iPod Touch, and this latest version is a direct result of the features our user community has voiced would make the ‘must-have' app even better," said Michael Thompson, senior vice president and general manager, Nuance Mobile. "And with support for more languages, we're answering the call from our Dragon fans around the world." Nuance also has available on the Apple App Store the iOS4-compatible Dragon Search mobile application that enables users to speak searches that are returned from a variety of content sources including Google, Yahoo!, Wikipedia, iTunes, YouTube and Twitter via the Dragon Search Carousel™. Both Dragon Dictation 2.0 and Dragon Search are immediately available for free on the Apple App Store for a limited time. To learn more, visit www.dragonmobileapps.com. Also be sure to follow Nuance on Twitter @DragonTweets and @NuanceMobile, and become a Fan of Dragon Mobile Apps on Facebook.